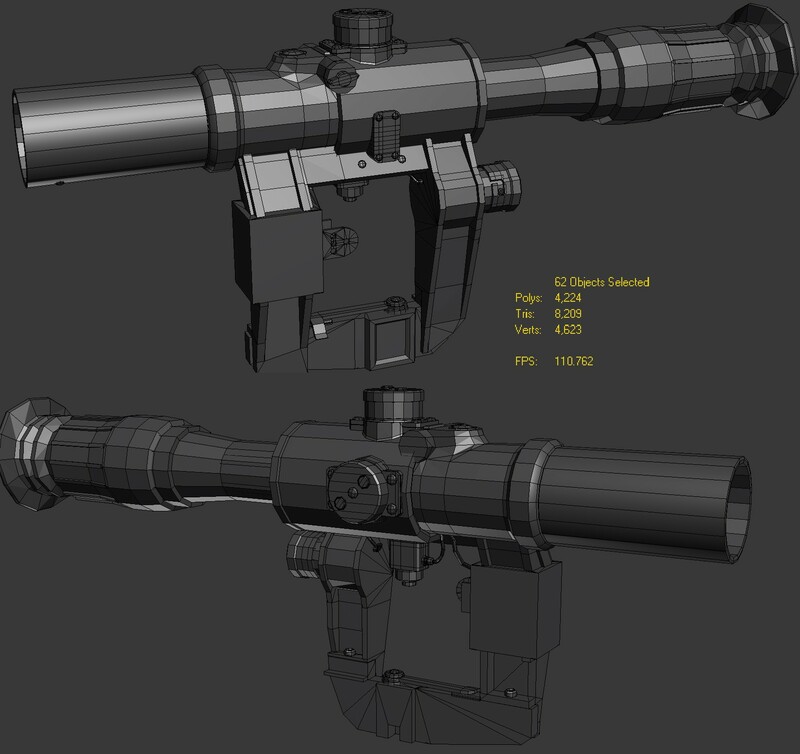 A scope I am currently making in High poly, some errors. > **Posted by Teh Snake** > Rubber thingy looks quite chewed. 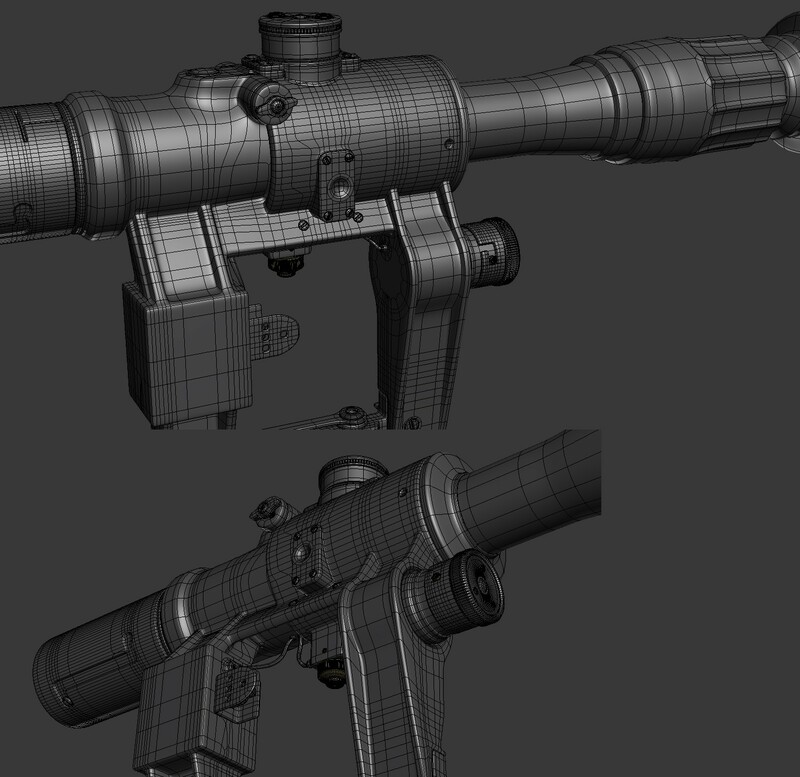 You should have made rubber part geometry twice detailed,since its some stuff closest to your eye ingame Good advice,The same goes for many other weapons...Think about the close up fp view ingame when uv mappping..Bigger means more room for detail. New SVD model...anyone? 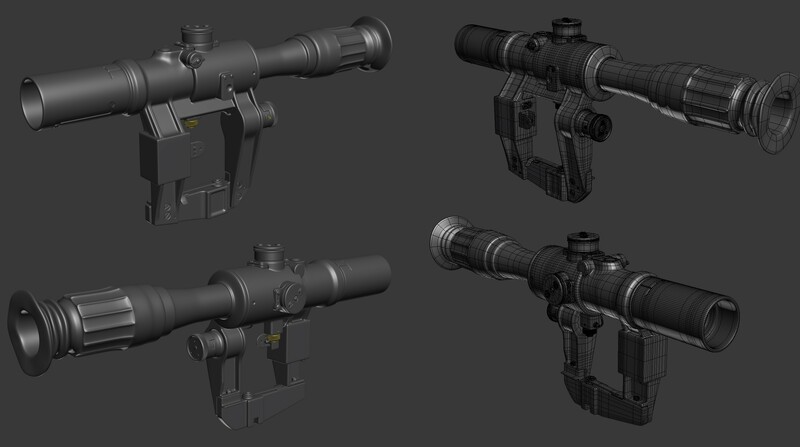 This here would shorten up some work IMO...oh this goes to VSS. > **Posted by SkyFall** > Looks great, but yeah that part looks a bit strange, did you used the padding i told you? Yep. I think it's just the geometry to be honest. Snakes probably right about doubling it, since it's closer to the eye. I will post a pic for you guys to see from another angle. Looks great, but yeah that part looks a bit strange, did you used the padding i told you? > **Posted by Teh Snake** > Rubber thingy looks quite chewed. 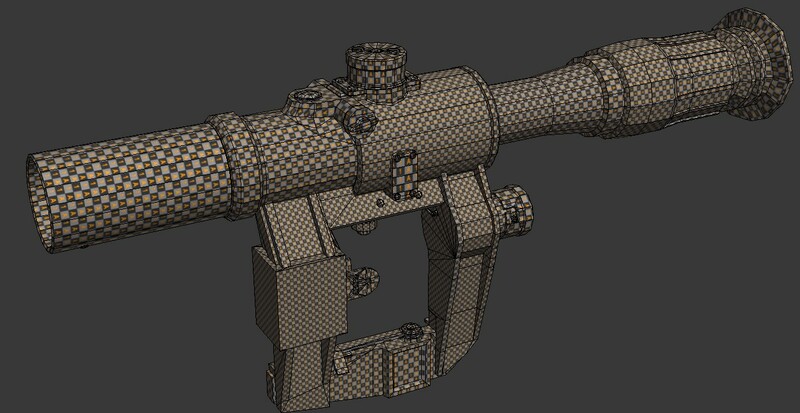 You should have made rubber part geometry twice detailed,since its some stuff closest to your eye ingame Now that I look at it closely, I believe you're right. From this angle it looks like a dogs chew toy. Crap. > **Posted by Hells High** > > **Posted by SkyFall** > > > > **Posted by Samm Varnish** > > > > > > **Posted by SkyFall** > > > > > > > Very detailed and well modeled, just i have a few suggestions. > > > > > > > > Image > > > > > > Thanks for the tips, I fixed some of them. But what do the yellow and green circles mean? > > > > Those bevels on those tubes, look so small and you can save a lot of polycount if you remove them and you apply that bevel on the normal map. 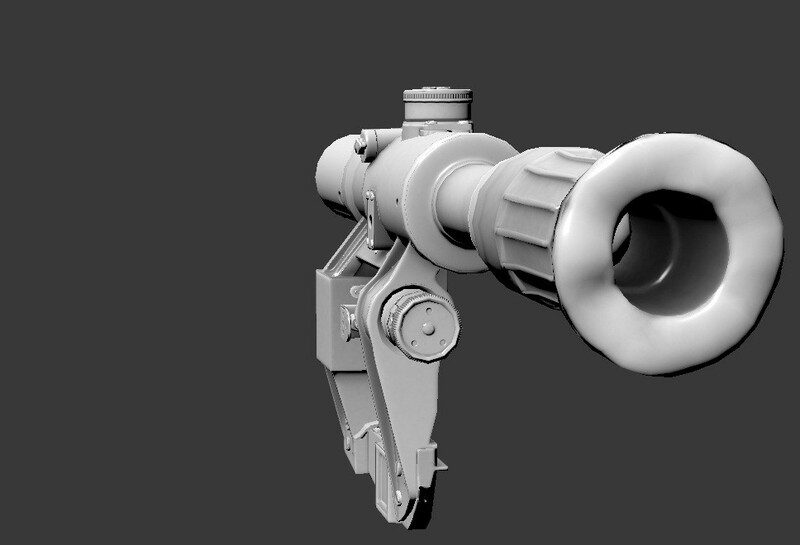 > > I'm guessing this is just the high poly, and those will be baked into the normal map and removed for the low poly. I always add those details on the normal map with any pattern, imo is a waste of time doing that in the HP, but both ways works too, and if you remove those on the LP, it looks flat and irregular, is better keep them on LP too. > **Posted by SkyFall** > > **Posted by Samm Varnish** > > > > **Posted by SkyFall** > > > > > Very detailed and well modeled, just i have a few suggestions. > > > > > > Image > > > > Thanks for the tips, I fixed some of them. But what do the yellow and green circles mean? > > Those bevels on those tubes, look so small and you can save a lot of polycount if you remove them and you apply that bevel on the normal map. 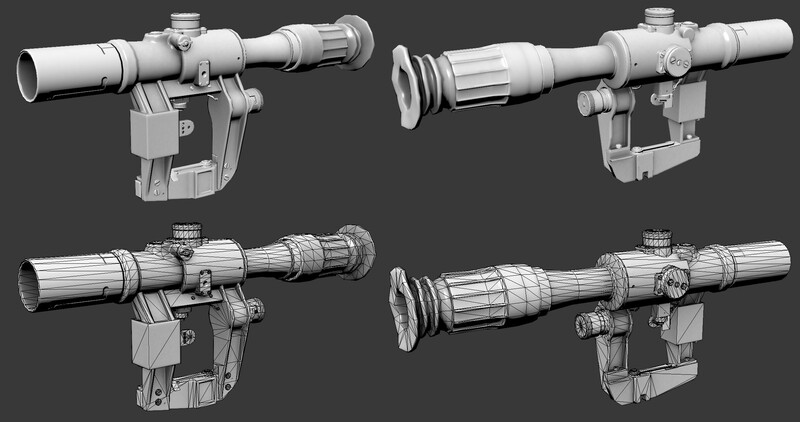 I'm guessing this is just the high poly, and those will be baked into the normal map and removed for the low poly. > **Posted by Samm Varnish** > > **Posted by SkyFall** > > > Very detailed and well modeled, just i have a few suggestions. > > > > Image > > Thanks for the tips, I fixed some of them. But what do the yellow and green circles mean? Those bevels on those tubes, look so small and you can save a lot of polycount if you remove them and you apply that bevel on the normal map.